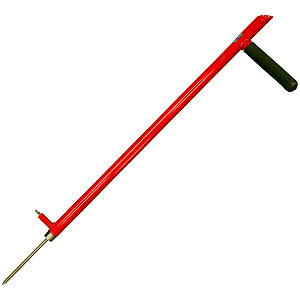 This 76cm long steel probe is perfect for setting flags in hard rocky or frozen soil. Using the probe simply create a pilot hole and drop in a flag. The probe is designed to carry up to 100 Flag-Marks in the handle allowing for convenient installation. Complete with a rubberised handle to protect against electrical hazards. Constructed of welded steel tubing with a rubber covered handle. Foot step for added leverage. The point can be removed and reversed for safety when the probe is not in use.